Sepak takraw or kick volleyball, is a sport native to Southeast Asia. Sepak takraw differs from the similar sport of footvolley in its use of a rattan ball and only allowing players to use their feet, knee, chest and head to touch the ball. In Indonesia, Malaysia and Singapore, it is called sepak takraw. In Malaysia, it can be known as sepak raga as well. In Thailand, it is called as takraw only. In Laos, it is kataw (Lao: "twine" and "kick"). In the Philippines, besides the borrowed term "takraw", it is also called sepak takraw and also has a similar sport called “sipa” or “kick”. In Myanmar, it is known as chin lone, and is considered more of an art as there is often no opposing team, and the point is to keep the ball aloft gracefully and interestingly. 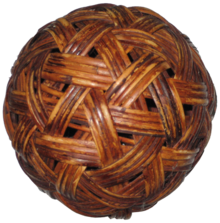 "Sepak" is the Malay word for kick and "takraw" is the Thai word for a woven rattan ball; therefore sepak takraw quite literally means "to kick a ball". Sepak takraw is known in many names across Southeast Asia; including Indonesian: sepak takraw; Malay: sepak raga; Thai: ตะกร้อ, RTGS: takro, pronounced [tā.krɔ̂ː]; Burmese: ပိုက္ေက်ာ္ျခင္း, Pike Kyaw Chin; Filipino: sipà, sipà tákraw, sepák tákraw, pronounced [sɛ̝päk täkɾɐw]; Khmer: សីដក់, Sei Dak; Lao: ກະຕໍ້, ka-taw; Vietnamese: cầu mây, "calameae ball" or "rattan ball". The earliest historical evidence shows the game was played in the 15th century's Malacca Sultanate of Malaysia, for it is mentioned in the Malay historical text, "Sejarah Melayu" (Malay Annals). The Malay Annals described in details the incident of Raja Muhammad, a son of Sultan Mansur Shah who was accidentally hit with a rattan ball by Tun Besar, a son of Tun Perak, in a Sepak raga game. The ball hit Raja Muhammad's headgear and knocked it down to the ground. In anger, Raja Muhammad immediately stabbed and killed Tun Besar, whereupon some of Tun Besar's kinsmen retaliated and wanted to kill Raja Muhammad. However, Tun Perak managed to restrain them from such an act of treason by saying that he would no longer accept Raja Muhammad as the Sultan's heir. As a result of this incident, Sultan Mansur Shah ordered his son out of Malacca and had him installed as the ruler of Pahang. In Thailand (formerly Siam), there was evidence that the Thai had played Sepak Takraw since the Ayutthaya Kingdom, at least during the reign of King Naresuan (1590–1605). A French historian, François Henri Turpin, wrote about how the Siamese played the game of takraw to stay in shape. Murals at Bangkok's Wat Phra Kaeo which was built in 1785, depict the Hindu god Hanuman playing sepak takraw in a ring with a troop of monkeys. The game was played in its circle form for hundreds of years, and the modern version of sepak takraw began taking shape in Thailand sometime during the early 1740s. In 1929 the Siam Sports Association drafted the first rules for takraw competition. Four years later, the association introduced the volleyball-style net and held the first public contest. Within just a few years, takraw was introduced to the curriculum in Siamese schools. The game became such a cherished local custom that another exhibition of volleyball-style takraw was staged to celebrate the kingdom's first constitution in 1933, the year after Thailand abolished absolute monarchy. ^ a b c Shawn Kelley. "Takraw: A Traditional Southeast Asian Sport". Archived from the original on 10 July 2007. Retrieved 30 July 2007. ^ J. A. Mangan, Fan Hong (2002). Sport in Asian society: past and present. Frank Cass Publishers. p. 220. ISBN 978-0-7146-8330-0. ^ "sepak takraw | Definition of sepak takraw in US English by Oxford Dictionaries". Oxford Dictionaries | English. Retrieved 18 September 2018. ^ Dunsmore, Susi (1983). Sepak Raga. University of Michigan. p. 2. ^ Brown, Charles Cuthbert (1970). Sejarah Melayu; or, Malay annals: an annotated translation [from the Malay]. Oxford University Press. p. 89. ^ "Permainan Sepak Raga". Melayuonline.com. Archived from the original on 25 March 2014. Retrieved 25 March 2014. ^ "Sepak Raga, Permainan Tradisional Masyarakat Di Propinsi Kepulauan Riau". Id.voi.co.id. Archived from the original on 7 November 2010. Retrieved 25 March 2014. ^ "The History of Takraw in Thailand". Sepaktakrawworld.com. ^ Sepak Takraw Saskatchewan Inc.
^ The Log, Northrop University Student Newspaper, 5 November 1987, Vol 35, No. 3. ^ Northrop University Magazine, December 1987, Vol 3, No. 4. ^ "Video". CNN. 8 August 1994. ^ Talking Takraw[Electronic Version]. Journal of Mens Fitness, Vol. 20, Issue 10. ^ a b c d e f g h International Sepaktakraw Federation (ISTAF) (2004). 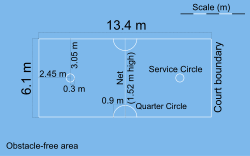 "Sepaktakraw: Laws of the Game" (PDF). Archived from the original (PDF) on 25 March 2009. Retrieved 29 July 2007.